The support provided by regular payments such as payroll gifts are absolutely vital to our programmes for children. It is only with sustained, stable funding that these programmes are able to deliver the ongoing help required to make a lasting difference to children’s lives – and your regular donation will ensure exactly this type of secure support. The winners of the 2017 National Payroll Giving Excellence Awards were announced yesterday at Clothworkers Hall in London. The awards showcase the best examples and recognise the excellent work carried out by companies and their employees. Winners included Arriva London, The Entertainer, Royal Bank of Scotland and the Royal Mail Group who received special recognition with a Lifetime Achievement Award. The Royal Mail Group have provided a Payroll Giving scheme for nearly 30 yrs and have seen thousands of colleagues, past and present, generously give through payroll to over 1400 registered charities and good causes. Employees have raised almost £60 million over the last three decades, with over £2.4 million raised last year. Arag Plc won Most Innovative Campaign – Small employer. The awards were presented by Peter Lewis, CEO, Institute of Fundraising and Panikos Efthimiou, Chair of The Association of Payroll Giving Organisations and Mervi Slade, Chair of Institute of Fundraising’s Payroll Giving Special Interest Group. Small – Winner – Arag Plc. Royal Mail is honouring 30 years of Payroll Giving with a special postmark. The postmark – which says ‘Royal Mail proudly supports 30 years of Payroll Giving’ - will appear on millions of items of UK stamped mail nationwide. It will land on doorsteps between Monday 10 and Saturday 15 July 2017. Launched in 1987, Payroll Giving allows employees to give to charity straight from their wages or pension without paying tax on it. Over the last three decades, the scheme has raised over £2 billion for good causes. Last year payroll givers donated more than £130 million. Lily Heinemann, Head of Corporate Responsibility & Community Investment at Royal Mail, said: “We are really pleased to be marking the 30th anniversary of Payroll Giving with a postmark. Our employees are incredibly supportive of Payroll Giving, raising over £58 million over the last three decades. Last year alone saw more than 20 per cent of our employees give through the scheme contributing more than £2.4 million for good causes. Payroll Giving in Action has created a new internet search facility that allows staff to see if their employer offers Payroll Giving. The launch of payrollgivingportal.uk coincides with this month’s 30th anniversary of Payroll Giving in the UK. The site currently includes details for about 3,000 companies. Jeremy Colwill, director at Payroll Giving in Action, which set up the site, said the target was to include all UK employers with 50 or more staff. Payroll Giving currently generates £130m a year. He said the site was not intended to shame companies into setting up schemes, but it could increase pressure on them if staff became more aware it wasn’t available. "As a next step, we would like charities to have this search facility as a plug-in to their website too," said Colwill. "A lot of people have been saying there should be a centralised database of employers that offer Payroll Giving." Ceri Edwards, director of policy and communications at the Institute of Fundraising, said: "We hope this new service will make it easier to set up schemes, as well as raise awareness of Payroll Giving." Ceri Edwards – Director of Policy & Communications, Institute of Fundraising. Employees from FirstGroup have raised £500,000 for charities by pledging portions of their monthly salaries. More than 1,000 colleagues from the transport operator have signed up to make tax-efficient, monthly donations to registered charities through the company’s Payroll Giving scheme in the UK. The £500,000 milestone, achieved over four years, arrived just in time for #GivingTuesday, a global campaign on Tuesday 29 November that harnesses the power of social media to collect millions of pounds for good causes. Employees are free to support any registered charity they wish through payroll giving. However, should they opt for FirstGroup’s charity of choice partner, Prostate Cancer UK, the company will match their first month’s donation. The partnership between FirstGroup and Prostate Cancer UK, which began in April 2015, aims to provide more than £1m of support for the charity’s work in helping men to survive prostate cancer and enjoy a better quality of life. More than £440,000 has been achieved through the partnership to date. James Beeby, Director of Fundraising at Prostate Cancer UK, said: “Since the beginning of the partnership in April 2015, FirstGroup employees have been an incredible support to Prostate Cancer UK. We are so grateful to those that are donating a portion of their wages to help us tackle the disease head on. Raising more than £3,600 for Prostate Cancer UK, from payroll giving alone, is incredible and is going to contribute in funding ground-breaking research that will help save men’s lives. FirstGroup works in partnership with Payroll Giving in Action to promote the scheme to employees. Get on board the Payroll Giving bus. Arriva London won Most Innovative Campaign - Medium at the National Payroll Giving Awards for decorating a heritage bus for Payroll Giving on #GivingTuesday. Arriva London is committed to spreading the word of Payroll Giving far and wide. #GivingTuesday was a fantastic opportunity for them to liase with the charities that benefit from their scheme and give them the opportunity to directly thank their Arriva London supporters and explain how vital the funds they receive are. They decorated a heritage bus with the #GivingTuesday logo and invited Payroll Givers and the corresponding charities they support to take a ride around London's landmarks. They are thrilled that the result of this campaign saw Arriva London being awarded the Platinum Quality Mark. They will be celebrating in style for 2016/17's campaign and have painted one of their in-service fleet Platinum coloured. Peter Batty, Commercial Director, said: "We are celebrating achieving the Platinum QM with a bus in unique livery to share the achievement of our staff with millions of people who use and see our buses everyday. Achieving the Platinum QM is something we are very proud of and provides sustainable income for hundreds of charities." Checkatrade won Most Successful Sustained Scheme - Small and Most Innovative Campaign - Small at the National Payroll Giving Excellence Awards held at St Martin in the Fields recently. Checkatrade offers a free service that allows consumers to find out background information so theycan make a confident decision about which trademen to contact. Checkatrade have promoted Payroll Giving since 2011, receiving the Platinum Quality Mark since 2012. For this years promotion, they held a tea party to celebrate the Queens's 90th birthday. Having always found it beneficial to have a representative from Payroll Giving in Action, they booked one of the team to go to all three offices. They encouraged staff to wear red,white and blue, ran a monarchy quiz, and even had a hat making competition. All these activities allowed members of staff to get involved and have fun, while also finding out about making a difference through their salary. Claire Byrne, Checkatrade Head of Finance said: "We had such a fantastic day at our Queen's birthday party event to coincide with promoting Payroll Giving. We were delighted with the results and with staff numbers increasing, we were keen to ensure all knew how easy it was to sign up." NATS (National Air Traffic Services) with Payroll Giving in Action won the Best Promotional Partnership - Medium category at the annual National Payroll Giving Excellence Awards held at St Martins in the Fields on the 16th of November. NATs is a leading air navigation services specialist employing over 4000 staff across the globe, half of which are highly skilled air traffic controllers and specialist engineers. Regular promotions are run with Payroll Giving in Action, promoting the scheme with face-to-face visits to their largest sites. All comms channels are used complimentarily: posters in common areas, 'tabletopper' comms in restaurants, electronic notifications on the intranet and digital signage on plasma screens around the offices. Payroll Giving in Action created a Giving Online® donation facility for NATS too. They launched a 'Gift A Shift' scheme where employees can donate shift earnings using one-off Payroll Giving donations. Doing this to support specific charities, for example their partner charities Aerobility and Ayrshire Hospice. James Deeley, Environment and Community Affairs Specialist, said: "Our employees have always been dedicated to supporting charities and worthwhile community projects. Payroll Giving allows an easy option for our people to do this. We are delighted that £140,235.00 was donated last year through our scheme." For the 12th consecutive year BT have been awarded the Charities Aid Foundation (CAF) Gold Payroll Giving Quality Mark Award. Working with CAF and Payroll Giving in Action, the BT scheme is one of the UK’s largest and most successful. In 2015/16, some £2.5 million was donated directly by BT UK people this way. Nicholas Mazzei, BT Senior Propositions Manager, said: “Payroll giving is the easiest and most tax efficient way for our people to donate to the causes they care about. The money goes directly to the charity and avoids costly overheads such as card transaction fees. Charities rely on the steady income from monthly giving, so it’s a great way to ensure each month that money goes to great causes”. Through the BT Payroll Giving scheme, BT people can donate to a charity of their choice such as a nationally recognised organisation or more local causes like hospices, animal welfare schemes, or overseas aid projects. Arriva London has recently been awarded the prestigious Platinum Award for Payroll Giving by the Charities Aid Foundation. The award is given to those organisations who have achieved twenty percent or more of their staff giving to charity through a Payroll Giving scheme. For the previous two years Arriva London had received the Gold Award, but with the help of an award winning promotional campaign, and the willingness of its staff to get involved, this year they have joined other top companies like British Telecom, Deutsche Bank, JP Morgan, Prudential and Royal Mail in qualifying as the first bus company to achieve this. The campaign theme, ‘It’s easy to give with Payroll Giving, your colleagues do it every day’, has been promoted through weekly road shows at each of the company’s seventeen London garages, together with a poster and video campaign, telling givers’ stories and also responses from the charities that are the recipients. All participants in the scheme are also entered into a company quarterly draw which gives four winners each a cheque from Arriva London for £250 for their chosen charity, and all givers are also entered into a ballot, giving them the chance to be one of forty participants in Arriva London’s 2016 Lord Mayor’s Show entry on November 12th. The beauty of the scheme is that the staff can chose exactly who they give to, and how much they give, and with such a diverse workforce it means that over 160 charities benefit, from well-known national or international ones to very local causes. “My money goes to Sierra Leone, for children under five, and the great thing about Payroll Giving is I can make that choice. I’m one of the twenty percent and I’m very proud of that. We need to maintain this going forward and so I’d like to recommend Payroll Giving to my colleagues”. “Arriva London staff support over 160 charities through the Payroll Giving scheme, some are very well known, some are not so well known, but to us they are all as important as each other”. “Being the first and only bus company to win the Platinum Payroll Giving Award is something really special, and I am immensely proud of this fantastic achievement by our staff. It means that over twenty percent of our workforce are giving to over one hundred and sixty charities, which speaks volumes of their commitment to such worthy causes. I have no doubt it will go from strength to strength and we will take every opportunity to encourage more of our staff to get involved, and hopefully achieve this great standard again for next year”. The awards ceremony, which took place on Tuesday 17th November, showcased the best examples of commitment and recognised those who have contributed to charitable giving through this unique form of fundraising. The judges ackowledged Henderson Group colleagues for the increase in both participation and contributions over such a prolonged period. The double matched applicable donations and 42% of employees are currently giving. Other notable winners included Arriva London and Checkatrade, all assisted in their promotions by Payroll Giving in Action. WaterAid receiving award from Jeremy Colwill - MD - Payroll Giving in Action. The Institute of Fundraising and the Association of Payroll Giving Organisations have today announced the shortlist for this year’s National Payroll Giving Excellence Awards. 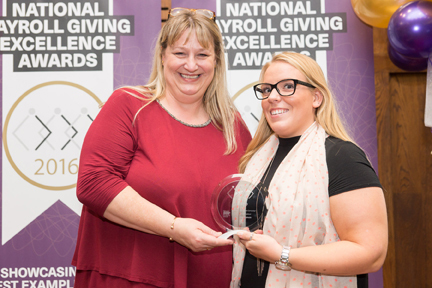 This year’s National Payroll Giving Excellence Awards Ceremony will take place on the afternoon of 17 November 2015 at the House of Lords, where all those nominated for an Award will gather to celebrate a year of innovative promotion in Payroll Giving, networking with Ministers, civil servants and employers keen to improve the success of their Payroll Giving schemes. The Institute of Fundraising (IoF) has announced that the National Payroll Giving Excellence Awards ceremony will be held in November this year to celebrate the efforts of employers, charities and professional partnerships in promoting Payroll Giving in the workplace. Any employer who has achieved a Bronze, Silver, Gold or Platinum Payroll Giving Award Certificate is eligible to apply for entry to the National Payroll Giving Excellence Awards. The Awards are organised by the Institute of Fundraising’s Payroll Giving Special Interest Group in partnership with the Association of Payroll Giving Organisations and will take place on 17 November 2015 in the House of Lords. The National Payroll Giving Excellence Awards are designed to showcase the best Payroll Giving schemes in the UK. The deadline for applications is 15 September 2015. Any employer who has achieved a Bronze, Silver, Gold or Platinum Quality Mark Award in 2015 is eligible to submit an entry for the National Payroll Giving Excellence Awards 2015. The deadline for applications is 15 September 2015. Winners of the Awards will be announced at a ceremony in the House of Lords on 17 November 2015. Henderson Group recognised for double matching new donations! Henderson Group efforts to boost charitable donations through their Payroll Giving scheme have been recognised with Best Medium Sized Employer Campaign at the National Payroll Giving Awards. Henderson Group, owned by the Agnew family, are the owners of the Spar, Eurospar, Vivo, Vivoxtra and Vivi Essentials franchises in Northern Ireland and have been distributing products for over 100 years. The Group are one of the largest employers in Northern Ireland with over 2500 employees and a turnover of over £620 million per annum. The partnership was recognised at the National Payroll Giving Excellence Awards 2014, at HM Treasury. Payroll Giving in Action and DHL Supply Chain (DHL) worked together to deliver a tailored approach and targeted communications strategy. DHL is the worlds largest contract logistics specialist, operating in more than two hundred countries globally and employing over forty thousand employees across UK and Ireland. DHL's Payroll Giving scheme has been in operation since 2010. In 2013 they set out to increase take-up of the scheme through utilising their network of Charity Champions and increasing promotional visits. DHL's partner Payroll Giving in Action has been visiting their sites annually for four years. By increasing site visits, adopting a more tailored approach and implementing a targeted communications strategy, DHL has increased uptake by over 5.2% in 2014. Over 275 different charities now benefit from regular donations through DHL's Payroll Giving Scheme. Arriva London has won the top honour at the annual National Payroll Giving Excellence Awards. In a ceremony held at HM Treasury on Tuesday night, Arriva London took out both the Best Large Employer and Best Overall campaign. Arriva London is one of the biggest bus operators in London, operating from nine garages and employing a diverse workforce of circa 5200. Arriva London had not had a focused promotional campaign to promote Payroll Giving scheme before, yet found 11% of employees were already engaging with the scheme. Arriva London wanted to give recognition to existing payroll givers and used the launch to highlight how successful the scheme already was and encourage more employees to join. They worked with Arriva Londons existing payroll givers and Payroll Giving in Action to gather stories of why they choose to support their favourite causes through Payroll Giving. Arriva London now has 13% of employees pledging over £50,000 per annum, a 32% increase in value of donations raised. Arriva London also selected Payroll Giving employees to travel on the Lord Mayors show parade on a Payroll Giving in Action branded Routemaster bus and also set up a quarterly prize draw for a £250 charity donation. Generous employees across Royal Mail Group have now raised £50 million for charity through the company’s Payroll Giving scheme, which began 25 years ago. The significant milestone has been met thanks to benevolent employees across Royal Mail and Parcelforce Worldwide donating regularly via their salary to over 900 charities. Retired employees also contribute to the scheme. The charities supported include a mix of national organisations as well a number of locally-based groups which are helping providing vital services at the heart of communities. There are around 38,000 members of the scheme, who on average donate £5 a month to their chosen charity or good cause. Peter Lewis, Chief Executive Officer of the Institute of Fundraising, added: “Royal Mail’s achievement in championing Payroll Giving is a fantastic example to all large employers. The £50 million that Royal Mail’s employees have donated to many charities shows real commitment from both the staff who give the money and the organisation for showing long-term support and leadership. Royal Mail Group’s scheme was awarded a Guinness World Record in 2012 for having the most registered charities supported by a Payroll Giving scheme. It still retains this record. The company also provides matched giving to those employees who donate a proportion of their salary to the Group’s Charity of the Year partner, Prostate Cancer UK. Royal Mail Group and its employees have together raised £1.8m million for the charity over the last 18 months (including matched giving), enough to fund at least 30 specialist prostate cancer nurses. Checkatrade offers a free service that allows customers to find out background information they need to make a confident decision about which tradesmen to contact. They currently have more than 11,000 members on their website, and send over 105 printed directories annually with each going to more than 50,000 homes. They employ 88 people. Taking inspiration from the fact that the amount people give is about the same that they spend on cheese, Checkatrade used 'National Cheese Day' as a key point in their campaign this year and even managed to get their CEO Kevin Byrne to dress up as a giant cheddar to engage staff and promote the scheme. Having received the Platinum Quality mark for the last two years, Checkatrade's employees now donate £7,900 each year to 27 different charities. Network Rail has won a top government-sponsored award for its successful programme to encourage Payroll Giving. It was judged the Best Large Employer in the UK’s National Payroll Giving Awards which recognise efforts by employers to encourage staff to support their favourite charities via the payroll. Network Rail's continued campaign has seen over 10% of their 33,992 employees donating £484,150.00 each year. They have acheived this by ensuring that every one of their employees knows that they offer the scheme through targeted communications, site visits, focus on their intranet and engagement of Charity Ambassadors. With a workforce dispersed in over 400 sites across the UK, their achievements are hugely impressive. Royal Mail Group has won the top honour at the annual National Payroll Giving Excellence Awards. In a ceremony held at HM Treasury last night, Royal Mail Group took out both the Most Sustained Scheme by a Large Employer and Best Overall campaigns. Nick Hurd MP, Minister for Civil Society and Nicky Morgan MP, Economic Secretary to the Treasury, presented the awards. Network Rail won the Best Large Employer campaign and Checkatrade received the Best SME campaign. Payroll Giving in Action has worked closely with these organisations over a number of years. The judges recognised Royal Mail Group's 25 yrs of commitment to Payroll Giving and almost £48 million donated from employees over the time. Over 1000 charities have been supported from the generosity of staff and a continued effort to sustain and promote Payroll Giving by Royal Mail Group continues to drive participation and raise awareness amongst staff. Nick Hurd MP, Minister for Civil Society and Nicky Morgan MP, Financial Secretary to the Treasury will present the winners with their awards at HM Treasury on 3 December 2013. Employers committed to encouraging their staff to donate to charity have an opportunity to showcase their achievements and share best practice with others as nominations open for this year’s National Payroll Giving Excellence Awards. Representatives from household names - that have in recent years included the Police Service of Northern Ireland, Network Rail and BT - will appear at the prestigious ceremony at the Treasury on 3 December 2013, hosted by Nick Hurd MP, Minister for Civil Society and Sajid Javid MP, Economic Secretary to the Treasury. The deadline for nominations is 18 October. Payroll Giving in Action has launched the world's first online 'donor passport' system — promising to reconnect charities with lapsed donors and boost take-up of the payroll giving scheme. Payroll Giving in Action already offers a Giving Online service — which allows people to quickly and easily donate to charities online through their employers' payroll giving schemes — and were the first to introduce mobile Payroll Giving. But the new Payroll Giving Portal, which was officially unveiled today (June 25) at the annual Payroll Giving Conference at the Home Office in London, takes the payroll giving process to the “next level” by providing a complete portable digital management system for employers, charities and donors. Donors are provided with a unique Payroll Giving Passport — a permanent online ID which allows them to amend or change their donation arrangements at any time, check historical donations, and receive updates from their chosen charities. Crucially, for the first time it allows donors to maintain their pledges to good causes even when they change employer — an innovation that could see charities receiving millions of pounds extra in otherwise 'lost' donations each year. It also provides the UK's only 100 per cent paper-free system for payroll giving, allowing employers and charities to access donor data in real time and set up deductions more quickly. The launch of the portal comes just months after The Institute of Fundraising — the professional membership body for UK fundraising — called on the government to create an online payroll giving portal to simplify and increase the portability of the scheme. Payroll Giving in Action (PGA) founder and director Jeremy Colwill says it will give payroll giving the “technological shot in the arm” it needs to succeed. Speaking yesterday from the organisation's head office in Barnstaple, Devon, he said: “One of the big issues faced in the payroll giving sector is the disconnect that occurs between donor, employer and charity. “This can occur when a donor leaves one job for another and does not remember to set up a new pledge through their new employer. The information trail grind to a halt and there's no way for the charity to get in touch again to prompt them. In January this year the Treasury launched a three-month public consultation on ways to improve payroll giving, with Economic Secretary to the Treasury Sajid Javid MP saying the charitable scheme had “real untapped potential”. PGA director Colwill says that the new online portal, which allows employers and charities to stay in touch with donors by email or text, is a “game-changer” for payroll giving. He added: “It's something the sector has been screaming out for and because the system is completely paper-free, it also overcomes the long-standing issue of slow data flow between charities and company payroll departments. The new portal also provides businesses and good causes with a range of promotional tools needed to promote the Payroll Giving scheme online, including through social networks. The Institute of Fundraising (IoF) today announced that the Government has committed funding to the Payroll Giving Quality Mark Awards and Excellence Awards for a further two years. The announcement means the Institute can now begin the process of awarding Quality Marks to thousands of workplaces engaged in Payroll Giving. It also means that the prestigious National Payroll Giving Excellence Awards will go ahead, as usual, later this year. Ceri Edwards, Director or Policy and Communications at the IoF, said: “Workplaces across the country have embraced Payroll Giving, providing charities with a regular income stream to rely on. And while donors get immediate tax relief, employers get a Quality Mark Award for demonstrating commitment to the causes that their employees care about. Is Payroll Giving the future for business and charities? Payroll Giving in Action (PGA) backs Britain’s charities and wants to encourage the business community to promote payroll giving online as an easy way to show how much they also want to Back Britain’s Charities. With charity funds being hit across the country due to the recession, we all need to get behind payroll giving and encourage people to give tax efficiently. Donating a few quid a month off the payroll is an easy way to automate giving and ensure that the charity gets the maximum tax gain too. HM Government recently consulted the payroll giving sector to engage with all the major stakeholder groups involved with promoting and growing the payroll giving market in the UK. The outcomes are still very unclear at the moment but it is unlikely the government will have any funds to significantly boost payroll giving, and therefore inflate charity incomes. A majority of people in the payroll giving sector want the HM Government backed Quality Mark and for the National Payroll Giving Excellence awards to continue, and to that end would urge the Government to not go back on their commitment to promote payroll giving as initially outlined in their recent Green and White papers on the subject. However, regardless of Government action, it is still possible for the charity sector to help itself to generate payroll giving income by accessing the payroll giving scheme online or via mobile internet. As much as £118m was raised among the 735,000 workers who signed up to the scheme last year, and thought the total amount pledged over the last few years has only been increasing slowly, the amount of people donating online through the payroll has increased dramatically with a 100% increase in some cases. Payroll giving is already the easiest way for employers to promote and employees to support their favourite charities on a regular and tax-free basis. For many employees, the time savings are great as it means no more paper forms to fill in and the freedom to give, amend or cancel donations at a convenient time. The gathering momentum of payroll giving online means that we expect to achieve £10 million extra donations for Britain’s charities within the next 12 months, but the figure could be much higher if all employers with over 500 employees promoted the scheme and all charities had payroll giving as an option on their website. It’s a win-win situation for charities, employers and donors. Payroll Giving in Action is now offering every UK charity a free Giving Online donation page to recruit payroll giving donations from their website. And if the donor’s employer doesn’t have a payroll giving scheme, we will ask the employer to set up a scheme to Back Britain’s Charities! If more people can easily support a charity through payroll giving then it’s another large step forward for Britain’s charities. Bouygues UK receive Highly Commended for new Payroll Giving scheme. A global leader in construction and services, Bouygues UK celebrates diversity in its London Head Office and many construction sites, with 350 employees from 39 different nationalities. At the NPGE Awards 2012 Bouygues UK received Highly Commended in the category of Best Launch of a New Scheme. This category recognises employers that have introduced a Payroll Giving Scheme into the workplace and shows the best integration of launch activities, promotion to staff and target achievement. The judges felt this scheme achieved great results and liked the smart phone QR code approach for signing up and the icon on staff computers. Network Rail has industry leading model Payroll Giving scheme. Network Rail's efforts to boost charitable donations through their Payroll Giving scheme have been recognised with a government endorsed third sector award. Network rail won the “Best re-launch of an existing scheme” prize, at the National Payroll Giving Excellence Awards, held at The Treasury in London on 30 October. The awards were sponsored jointly by HM Government, the Institute for Fundraising, and the Charities Trust. Network Rail also achieved a “highly commended” in the awards’ “Best innovative promotional partnership category, with fundraising organisation Payroll Giving in Action. “The award reflects our success in tripling the uptake of charitable giving through payroll from three per cent of employees to nearly nine per cent,” said Martin Arter, Programme and Technical Services Director and Head of the Charities Panel. “Our success has been driven by Sue Hardy, our community investment executive, who does all the hard work to support the charity panel and ambassadors, and manages the relationship with our charity partners. Her campaign to increase awareness of the Payroll Giving scheme – combined with the generosity of our staff – has delivered this result. The support and partnership of Payroll Giving in Action is also recognised, which is a great commendation. BT has won a top government-sponsored award for its successful programme to encourage Payroll Giving. The Best Large Employer award is made to the organisation with 1,000-plus employees that is judged to have carried out a particularly well-constructed and thought-out promotions with measurable results. BT Senior Programme Manager- Charity Partnerships, Beth Courtier, said BT had seen off competition from Deutsche Bank, Aviva and Henderson Group to win the award. “The judges said our campaign was impressive and innovative with excellent results,” she said. Beth added that BT is committed to driving up donor numbers and ensuring all employees are aware of the benefits of Payroll Giving. “We are also committed to raising awareness of this sustainable income across the voluntary sector and sharing best practice with other organisations,” she said. Beth herself was recognised at the awards for her personal contribution to Payroll Giving. Winners at the 2012 National Payroll Giving Excellence Awards included BT, Network Rail, The Police Service Northern Ireland and Bouygues UK. Speaking at the National Payroll Giving Excellence Awards, Nick Hurd, Minister for Civil Society, said: “We want to help make better connections between business and charities, which is why we introduced the Platinum Quality Mark Award to recognise the very highest standards in Payroll Giving. For the employer that has introduced a Payroll Giving scheme into the workplace and shows the best integration of launch activities, promotion to staff and target achievement. For the employer that has reviewed a scheme and increased their overall participation rate by adopting an active and innovative approach. The successful employer will have evaluated their methods of recruiting Payroll Givers and have planned for regular, ongoing promotional activities. For the employer with more than 1000 employees that has carried out a well-constructed and thought-out promotion with measurable results. The category winner will be able to show how the campaign was introduced and the important factors impacting on the outcome. The winner will also be able to illustrate that the campaign included originality, innovation and creativity. For the Public Sector employer that has carried out a well-constructed and thought-out promotion with measurable results. The category winner will be able to show how the campaign was introduced and the important factors impacting on the outcome. The winner will also be able to illustrate that the campaign included originality, innovation and creativity. For a Payroll Giving promotion which was successful as a result of a partnership between the employer and any other organisation, including a Payroll Giving Agency, Professional Fundraising Organisation, Charity or Charity Consortium or other external organisation. The category winner will need to illustrate the expectations and outcomes of the partnership, highlighting innovation and creativity. AES Kilroot Power Ltd is one of the first to receive a Platinum Quality Mark, in recognition of the number of employees donating to charity directly from their pay. AES Kilroot Power Limited is part of the AES Corporation – a global power company which has its corporate headquarters in Arlington, Virginia, USA. AES encourages each of its businesses to work directly within their surrounding communities in order to support corporate social responsibility programs that are a key part of our company core values and tailored to fit local needs. "At AES Kilroot, we have always been involved in helping the local charities and communities in which we operate and as such we are very pleased to accept this Platinum Payroll Giving Quality Mark award. This award is gladly accepted not only in recognition of the company commitment to gift matching through Payroll Giving, but also for the AES employees who give generously in personal donations of both time and money in order to help local charities in Northern Ireland. AES Kilroot will continue to support those who are already donating through Payroll Giving and as a company we will seek to increase the numbers of employees who participate in payroll giving by actively promoting this scheme. AES Kilroot will also strive to show the AES Company commitment by continuing to make a positive contribution to society." Mark Miller, AES UK Country Manager. The workforce of Royal Mail Group today became Guinness World Record title holders after the UK postal service was awarded the record for the most registered charities supported by a Payroll Giving Scheme. In the 23 years since Payroll Giving was introduced at the company, Royal Mail Group employees have given £45 million to 975 registered charities via the scheme. With around 42,000 employees giving to charities directly from their payroll, the Group's Payroll Giving employees account for 6% of all payroll givers in the UK. One in four of the Group's employees are signed up to give via this tax-effective method. The 975 charities consist of a wide range of organisations, and includes the Royal Mail Group's own charity, the Rowland Hill Benevolent Fund. Royal Mail Group received the Guinness World Records official certificate at a special ceremony in London. Chief Executive Officer, Moya Greene, said: "Our postmen and women play a vital and trusted role in every community across the UK. I am delighted that our postmen and women have been recognised as the world’s best for donating to charity direct from their pay." Applicants will be expected to provide the necessary support material so that their application can be verified where necessary. Applications should be made to the Payroll Giving Centre by the end of February 2012 who will distribute the Platinum Awards from April 2012.
Business chiefs say Payroll Giving to charity has massive potential. Business chiefs have called on British companies to back a scheme that allows workers to give part of their wages directly to charity. The heads of multi-million pound firms including BT and Whitbread say lack of support within the business sector is preventing the Payroll Giving scheme from delivering on its "massive potential". Businesses that employ the scheme, say it is the "most effective" way to give to charity and are appealing to employers across the UK to join the estimated 10,000 businesses already offering Payroll Giving. Chairman of BT Group Sir Michael Rake said: "Payroll Giving is the simplest and most effective way to give to charity, both for employers and employees, and has been promoted by the government as a great way to boost charitable giving overall. "BT alone raises £3.5m for charities through Payroll Giving every year, but many more British businesses need to get behind the scheme if it is ever to truly deliver on its massive potential. Whitbread CEO Andy Harrison said: "At Whitbread we are very proud of our Payroll Giving scheme which is an important part of our broader 'Good Together' CR programme. "Over 20 per cent of our team members have chosen to donate regularly in this way as it's easy and tax efficient. I would encourage every employer to be a force for good by helping their people support the charities of their choice in this way." Last year, some £53 billion was raised by UK charities. Gift Aid donations alone topped £1 billion while payroll giving raised over £114 million. Cash is still the most common way of giving money to charity, accounting for half of all donations, followed by direct debits and buying goods from charity shops. Charities and businesses, however, have been keen to push Payroll Giving as the preferred way of giving to charity because donations are tax-free and in some cases matched by employers. But it's not only business leaders who want to see greater support of the scheme. A new survey conducted on behalf of Payroll Giving in Action reveals that over three-fifths of British workers (61 per cent) believe employers should offer the scheme to staff. A spokesman for the organisation, which polled 2,000 adults, said it sent a clear message to businesses that there was still "tremendous support" for payroll giving. Founder Jeremy Colwill said: "The poll shows that despite having its critics, Payroll Giving still has tremendous support among members of the public. "It is now up to businesses both big and small to listen to their staff and promote the scheme within the workplace. Their involvement is key to the survival and future success of Payroll Giving." As a result of its findings, Payroll Giving in Action, based in Barnstaple, Devon, has launched bespoke Payroll Giving web sites for every employer and charity including a secure online donation form and user-friendly smart phone app called Giving Online and GO Mobile. Charities including Clic Sargent and Children in Need, and companies including Whitbread -- a winner in the recent National Payroll Giving Excellence Awards held at No. 11 Downing St -- have already trialled the new Payroll Giving Online services, which are aimed at businesses and their employees. Henderson Group received a Highly Commended award for the Best Re-launch of an Existing Scheme at No 11 Downing Street. Family owned Henderson Group is one of the largest employers in Northern ireland with 2258 employees, distributing food and grocery-relaated products to the convenience retail sector. The judges thought it was a fantastic demonstration of what can be achieved with drive and commitment in the face of economic difficulties. The re-launch planning co-ordinated by Payroll Giving in Action, included buy in from the Chairman, MD, Board and SMT, with donor matching and paying administration fees. Whitbread Plc, the largest hotel and restaurant company in the UK, won the Best Overall Campaign and Best Large Employer Campaign at the National Payroll Giving Awards held at No 11 Downing Street on Tuesday 18th of October 2011. The awards were hosted by the new Economic Secretary to the Treasury Chloe Smith MP and Sir Gus O'Donnel, Cabinet Secretary and Head of the Home Civil Service. Whitbread has over 20% employee participation in Payroll Giving and the judges liked the innovative, inclusive approach, double matching, translation of materials for employees and innovative online employee benefits page. This campaign, co-ordinated by Payroll Giving in Action generated in excess of £250,000 per annum. Whitbread Plc brands include Premier Inn, Beefeater, Table Table, Brewers Fayre, Taybarns and Costa Coffee and employ over 35,000 people. Payroll Giving in Action has launched the UK's first smartphone-friendly payroll donation service. The new mobile service – called “GO Mobile” – gives the estimated 17 million and rising smartphone users in Britain a swift, secure and flexible means of helping the charities and good causes of their choice tax-free. For the first time, owners of all smartphone devices – including iPhone, Blackberry and HTC – can now access Payroll Giving's highly successful Giving Online initiative, which allows employers to create and promote their own Payroll Giving donor recruitment website to employees. The arrival of GO Mobile comes just days after a new report by telecoms regulator Ofcom showing that nearly one in three adults in the UK now owns a smartphone. It also chimes with Prime Minister David Cameron's pledge to promote Payroll Giving as part of his Big Society vision. Payroll Giving in Action (PGA) founder and director Jeremy Colwill says that accessing the Payroll Giving scheme online or via mobile internet is the “way forward” for charitable donations. Speaking from the organisation's head office in Barnstaple, Devon, he said: “Giving Online is already the easiest way for employers and employees to support their favourite charities on a regular and tax-free basis. “With GO we have now made this service fully compatible with all smartphone devices, meaning that people can donate to charity anywhere, any time, quickly and securely. Giving Online has so far accounted for £1.75million in donations and 3,400 new pledges. Mr Colwill says that with the roll-out of Giving Online and GO Mobile – as well as the implementation of unique QR (Quick Response) codes for every PGA-created website – he expects the organisation to reach £10 million in donations within the next 12 months. He added: “It's a win-win situation for charities, employers and donors. “Employers benefit from having a simple, branded online facility for staff to use that can promote charity partners and help achieve a Gold Quality Mark Award. “This site can then be shared with employees electronically or via a specially-created QR code, which can be added to official literature to really open up the promotion of Payroll Giving online. It’s the generosity of BT staff that makes the company’s Give as You Earn scheme one of the UK’s largest and most successful. In 2010, some £2.5 million in cash was donated directly by UK employees this way. At the corporate level BT works directly with strategic charity partners, notably the children’s charity ChildLine and Cancer Research UK. Many employees also choose to support these charities through Payroll Giving as well as thousands more causes closest to their hearts. plan with confidence. This means that we can continue our work at the heart of local communities, making a lasting difference to many of the UK’s most vulnerable children and young people. Showcasing the best examples of employers’ commitment to Payroll Giving and the benefits to UK charities. To qualify for a 2011 Award, the Payroll Giving promotion/campaign must have taken placebetween April 2010 and March 2011. Applications are open to all employers receiving a 2011 Gold, Silver or Bronze Quality Mark Award. In the UK, Rolls-Royce finances the administration of a Payroll Giving Scheme enabling employees to make tax-free donations to their chosen charities. Since its launch in 1998, employees have donated over £4 million to the charities they care about with almost £430,000 to more than 350 charitable causes in 2009 alone. The scheme is recognised as Gold Award standard by the UK Government’s Payroll Giving Quality Mark, with approximately 14 per cent of UK employees participating in the scheme. For the second year in a row, the number of Payroll Giving Quality Mark Award certificates distributed to businesses will increase. In April, 3,631 certificates will be distributed to employers, an 8.5% increase on 2010. The Gold, Silver and Bronze certificates are presented to employers offering a 10, 5 or 1% take-up of the scheme amongst their employees. “It is great to see so many employers ‘going for gold’ and actively participating in Payroll Giving. Giving through your payroll continues to fare well in the current economic climate. New research from the Chartered Institute of Payroll Professionals (CIPP) has revealed that on the whole, payroll professionals are open minded to Payroll giving schemes.The CIPP Payroll Giving Schemes survey found that nearly three-quarters (73%) of respondents who participated in the research operated Payroll Giving within their companies. Furthermore, of those who do not run a scheme, 18% said they are considering implementing one in the foreseeable future and more than half (55%) said they would maybe consider it. Of the 27% of respondents who said that they do not run a scheme, nearly two-thirds (63%) of payroll professionals foresee a lack of employee engagement as the main barrier for its success. More than half (53%) identify the uncertainty around the administration process as a reason for not operating a scheme and more than a third (37%) pinpoint the cost of running a scheme as a major impediment. However, more encouraging are the reasons identified by payroll departments for currently running or considering operating a scheme. Two-fifths (41%) said that their employees have requested a Payroll Giving scheme, more than a third (37%) commented that it is to provide a tax saving to workers and a third (33%) thought it requires a minimum amount of administration work but is a benefit to employees and charities. Karen Thomson, Associate Director of Policy, Research and Strategic Visibility at the CIPP and a judge at the 2011 National Payroll Giving Excellence Awards, said: “I am impressed by the number of CIPP members who responded to our survey who said that they currently operate a Payroll Giving scheme, as well as those who are considering implementing one in the near future. “However, it appears that one of the main obstacles that prevent organisations from operating a scheme is due to the lack of understanding and communication around the process. I encourage payroll departments to speak to their employers about what implementing a Payroll Giving scheme entails and whether it would be a feasible option for the company. “Furthermore, payroll departments should also speak to their employees about the benefits of Payroll Giving for both the company and charity involved, especially the applicable tax deductions. Payroll Giving is a fantastic and cost-effective way for employees to provide charitable donations to the causes they care about. The date and venue has now been confirmed for the National Payroll Giving Excellence Awards, Tuesday 18 October – 18.30, at HM Treasury Building, 1 Horse Guards Road, London, SW1A 2HQ. 2011 is the British Heart Foundation's 50th birthday, so what better time to join the celebrations and get involved in Red for Heart? You could bake the world’s biggest strawberry cake, cycle in a red nightie or simply wear red socks – it’s totally up to you. What really counts is being part of this historic year and BHF want to invite you to join the party. Another easy way to show your support is on National Wear Red Day. It’s on Friday 25 February and you can take part at work, at school or at home. It’s a great excuse to get dressed up (as much or as little as you like) while raising much-needed funds for British Heart Foundation's vital work. The Police Service of Northern Ireland has won the top honour at the annual National Payroll Giving Excellence Awards. In a ceremony held at HM Treasury last night, the Police Service Northern Ireland took out both the best public sector employer and overall campaigns. Nick Hurd MP, Minister for Civil Society and Justine Greening MP, Economic Secretary to the Treasury, presented the awards. The awards, which are hosted by the Institute of Fundraising, had a record high number of entries. Payroll Giving in Action are delighted to have helped the Police Service Northern Ireland to achieve these awards and the judges recognised our partnership’s extremely impressive achievement in difficult circumstances. Obstacles were considered and overcome in a complex working environment which less employers might have deemed insurmountable. There was excellent senior management endorsement and over 50% of new staff signed up. The judges felt that the Police Service Northern Ireland and PGA demonstrated that it is always possible to make a great success of Payroll Giving. Anyone who thinks “you couldn’t make Payroll Giving work in our organisation because….” should reflect on the difficulties that this employer overcomes, together with the benefits that the employer, staff and charities all gain as a result. The ceremony was told that Payroll Giving had increased overall during the last year by 2 per cent, to reach £106m. Church Housing Trust is currently running a major appeal to raise £98,855 to furnish and equip a new supported housing project for Ex-Services in Catterick, North Yorkshire. Due to open in January 2011 and currently under construction, ‘The Beacon’ will comprise 31 self contained apartments for Ex-Service men and women and will replace The Galleries scheme in Richmond, North Yorkshire. The whole ethos at ‘The Beacon’ will be on helping the residents prepare for civilian life, focusing on life skills, practical skills training and preparation for work. It will include a training kitchen, an employment centre and a technology centre. When completed Church Housing Trust will continue to provide funding for the residents in the form of welcome & resettlement costs, training, equipment, activities, outings and other provisions for which statutory funding is unavailable. UK charities can now have a bespoke Giving Online page created for generating Payroll Givers. Payroll Giving in Action, the leading provider of Payroll Giving solutions in the UK, will provide a Giving Online tool to all UK charities to enable the charities to recruit Payroll Giving donations securely online. This exciting offer will save charities from having to use expensive web designers to create a Payroll Giving page and save on administration in setting up the donation because Payroll Giving in Action will also notify the donor’s payroll department. This offer will be a huge benefit to charities with little administration. The individual Giving Online donation page is created with a unique web address. Major UK charities including Clic Sargent, Barnardos and Make A Wish Foundation have already trialed this facility and receive Payroll Giving income. Oxfam launches a rapid relief effort to reach almost 400,000 people with clean water, sanitation kits and hygiene supplies. The international agency is trucking water and installing tanks to help prevent the spread of water-borne diseases amongst the estimated 1 million people affected. Oxfam’s Pakistan Director Neva Khan said:”This is the worst flooding in living memory and it’s likely to get worse as rivers and dams reach dangerous levels. Whole villages have been swept away and villages south of the devastated area in Sindh may be hit in the coming days. Oxfam is appealing for $US6 million to help people get through the immediate days and weeks and to boost recovery over the long-term. The agency is also planning to provide hygiene kits to help people who have lost everything in the floods, as well cooked food and cash for work. Church Housing Trust has launched an appeal to raise funds for an innovative furniture recycling project at a number of hostels for homeless people in North London, and has provided seed funding to get it off the ground. The North London Furniture Recycling Project is run by staff and residents at Livingstone House, a 92 bed supported housing project in north London for ex-homeless men and women with mixed support needs. It enables disused furniture and equipment from vacated sheltered & general needs housing to be recycled and refurbished for reuse by the hostel residents when they are ready to move on. Disused items like these would normally end up in landfill sites due to a lack of storage space and lack of funds to cover the cost of collecting and transporting these items to storage that is available. Electrical items such as cookers, fridges and even kettles also need to be safety tested before they can be re-used. The North London Furniture Recycling Project provides initial fortnightly van hire to collect and transport these items to Livingstone House where they are stored in a portakabin until they can be reused by residents who are moving on into independent accommodation. The project also provides PAT testing of all unused electrical equipment. When residents move on from such hostels to independent living, they often have no possessions of their own and will be moving into a completely empty flat with no furniture, bedding or kitchen equipment. This greatly increases their risk of failing their tenancy and slipping back into the ‘revolving door of homelessness’. The North London Furniture Recycling Project increases their chances of a successful reintegration back into the community. Almost 400,000 children in the West African country of Niger are at risk of dying of starvation over the summer. Save the Children is calling for urgent donations to its £7 million emergency fundraising appeal for the country. Up to 380,000 children under the age of five - one in eight – are facing severe malnutrition as a result of crop failure caused by an unexpectedly long drought. At the same time food prices have soared by 30 per cent. In a desperate attempt to get food, children as young as five are travelling hundreds of kilometres across the country to the capital, Niamey, with their families to beg on the city streets. More than half of Niger’s population - 7.1 million people - already don't have enough food as a result of the food crisis. The United Nations has warned that the situation looks set to become worse than Niger’s last major food crisis in 2005. This year’s National Payroll Giving Excellence Awards (NPGA) is to be held on 5th October and with Payroll Giving continuing to stand firm throughout the recession – it looks like another bumper year for the Awards applications. Any organisation that has achieved a Bronze, Silver or Gold Quality Mark Award this year is eligible to enter the Awards. Payroll Giving recognition is on the the up. The Institute of Fundraising has announced that a record number of Payroll Giving Quality Mark Award certificates have been distributed in 2010 – 3,347, which is over 1,200 more than last year. The Awards recognise employers’ commitment to Payroll Giving and this increase demonstrates that despite the economic downturn, Payroll Giving is proving a resilient and effective way for employees to give. In addition, employers added over £13 million to their employees’ contributions throughout 2008/09 – a welcomed boost to UK charities. Any organisation that has achieved a Bronze, Silver or Gold Quality Mark Award this year is eligible and welcome to enter the National Payroll Giving Excellence Awards. The deadline for entries is 16th July, which means that employers still have time to submit their applications to the judging panel. Why its never been easier to Give As You Earn. The death of a loved friend or colleague, respect for the heroic efforts of British soldiers, or simply the desire to make a difference - these are all reasons why BT people have dug deep to make charitable donations. But with the recent introduction of an online Give As You Earn (GAYE) donation form, giving has never been easier, according to BT community investment programme manager Beth Courtier. And, with donations matched by BT, it’s a great way of making your donation go even further. “The Giving Online BT donation form has proved extremely popular - making it even easier for employees to give in a tax-efficient, sustainable way to the charities and community groups of their choice,” said Beth. More than 10,000 employees in the UK give regularly via GAYE and, in 2009, BT people’s favourite charities benefited from GAYE donations of more than £3.5m - including matched funding from BT of £1m. Here, four BT people talk about why they donate via GAYE - and why they’d encourage others to do the same. GAYE has made a small - but crucial - difference to BT Operate end-to-end customer experience manager Mark Griffin. “Prior to November last year, I gave to ibcuk.net, a small charity dedicated to inflammatory breast cancer - a rare but awful variant that my wonderful lady wife died from in December 2007,” he said. He also donates via GAYE to Médecins Sans Frontières - and a local playgroup in Bishopthorpe, York, where he lives. BT Global Services senior consultant Andrew Pines wanted his charitable giving to be more proactive. “Every time something dreadful happens I feel compelled to do my bit by giving a donation,” he said. “It all seemed very reactive. Was I supporting the causes I deemed worthy enough? BT Operate customer training manager Anne Marie Jephcott read about the simplified GAYE process just days before a colleague - an engineer she had worked alongside - died after battling cancer. “His funeral was at a crematorium, so taking a wreath to the funeral seemed pointless as there was no grave,” she explained. “GAYE was an ideal opportunity to do something long term in memory of the engineer. There was no messing about with forms or having to go to the bank, she added. “I was very impressed as to how easy it was - and feel I now have a lasting tribute to a very dedicated and hard-working colleague who was always there to help,” she said. The matched funding by BT made GAYE worthwhile for BT Operate product support manager Miles Millington. “My charity is Help for Heroes,” said Miles. “I wanted to contribute towards our armed forces - particularly those who’ve given so much and now need help themselves. As the death toll from Saturday’s earthquake in Chile reaches more than 700, the international Red Cross response is taking shape. At a magnitude of 8.8 on the Richter scale, the earthquake is one of the ten largest ever recorded. The British Red Cross launched the Chile Earthquake Appeal on Sunday 28 February – money raised will go to support the work of the Chilean Red Cross, which has been working on the ground since the earthquake hit. The Chilean Red Cross is working closely with the country’s national emergency office to provide immediate aid to people affected. It is highly experienced in responding to disasters of this kind, as Chile’s location makes it especially prone to earthquakes. It has volunteers working in the affected areas providing first aid to survivors, and has worked hard in recent years to make sure local communities know how to respond in a crisis. Staff and volunteers are also broadcasting public service announcements on how to respond to aftershocks, and are appealing to the public to donate blood. Mike Goodhand, British Red Cross head of disaster management, said: “We are beginning to get reports of significant damage to roads, bridges, buildings and other infrastructure. Access into some areas is still difficult and aftershocks being additional risks to survivors. All across the UK, famous landmarks were illuminated red to launch National Heart Month on Monday February 1st.. From the Eden Project to the London Eye (pictured left) and all the way up to the National Portrait Galleries in Scotland. National Heart Month is The British Heart Foundation’s annual campaign to increase awareness of heart and circulatory disease and to raise funds for research, prevention and care services. During National Heart Month, BHF are also asking people to be a part of Red for Heart and raise vital funds for their work. Join National Wear Red Day on Friday 26 February 2010 or choose your own event - anything goes as long as it's red! Together we can save the life you love. Haiti update - charities involved in relief effort. With reports that ‘over 200,000’ people may have died in last Tuesday’s earthquake in Haiti, we thought it would be helpful to give you an update from some of the charities working in this region that you may wish to support. With millions of people affected by the earthquake, your support is desperately needed to help us reach as many Haitians as possible. ActionAid – The situation is still chaotic, with transport and communications links so badly damaged that delivering aid is a serious challenge – but ActionAid staff are working round the clock to get help to those who need it most. As the operation gears up, staff in Haiti have been joined by emergency specialists from the UK, Brazil and Guatemala. .
ActionAid will prioritise vulnerable women, children, the elderly and people with disabilities. British Red Cross – Over the weekend, relief supplies and personnel continued to arrive in Haiti and the surrounding area. Thousands of survivors have been sleeping outdoors, desperate for food, clean water and shelter. Air and sea ports in Haiti were damaged by the earthquake. The airport in Port-au-Prince has now reopened and is working at full capacity. However, the high volume of arriving planes means that many are being rerouted to Santo Domingo airport in neighbouring Dominican Republic. A British Red Cross team of logistics experts arrived in the Dominican Republic on Saturday. They will ensure that relief supplies arriving at the airport in Santo Domingo are processed and forwarded to the affected areas in Haiti as quickly as possible. CAFOD – As a clearer picture emerges of the devastation from Haiti’s earthquake, we have increased our pledge to £300,000 to support the vital humanitarian relief efforts of our Caritas partners. Merlin – Merlin’s specialist Emergency Response Team arrived in Haiti on Saturday and have immediately set to work identifying the most pressing medical needs and coordinating with those on the ground to make sure our response is as effective as possible. Our logistics team has already procured 4,800kg of surgical equipment for a tented surgical hospital, containing everything from the drugs to the team’s rations to the micro-surgery instruments, and this will also arrive on the ground shortly. Oxfam – The Oxfam team in Port-Au-Prince is working on assessments now. This is the essential first step in emergency aid delivery. Oxfam has linked with the UN and other aid agencies on the ground. The UN, many of whose own offices were levelled, has regrouped its headquarters near Port-au-Prince’s stricken airport. Oxfam also has already sent up to 10 tonnes of water, sanitation, health and shelter equipment, valued at around £70,000. It also has pre-positioned stocks in Panama on stand-by. Oxfam plans to scale-up aid delivery are now being finalised. The destruction continues to severely hamper aid efforts. UNICEF UK - We’ve sent emergency teams from around the region to help and UNICEF aid is getting through, providing clean water, preventing disease and saving lives. However more supplies are urgently needed. UNICEF is rushing life-saving supplies into the hardest-hit communities in Haiti. Our response, coordinated with other UN agencies is aimed at the children and women, who are the most vulnerable in times of crisis. Children under 18 make up nearly 50 per cent of the 10 million population of Haiti. In the town of Jacmel this evening 2,500 kitchen kits and 5,000 1 litre bags of water will be distributed to enable the local population to prepare the food supplies by the World Food Programme. Britain's leading carbon offset provider has pioneered a paper-free application process to help conserve the UK's ancient woodland. Payroll Giving in Action has become the first in Britain to scrap paper applications in a groundbreaking bid to protect ancient woodland. The move could save up to 5,000 trees each year when electronic requests take over in the summer. Until now, companies looking to go green have had to apply for carbon offset programs, such as tree-planting schemes, using traditional paper forms. In a bizarre twist, this has led to the increased felling of pine, spruce and birch - timbers commonly used to make paper. But from July 30 Payroll Giving in Action, based in Barnstaple, will phase out ''the vast majority'' of paper applications in favour of a more eco-friendly, online service. They claim the 'Carbon Capture' initiative will reduce the organisation's paper trail by as much as 60 per cent, and could save up to 75 tonnes of paper each year. It will also create new woodland through a partnership with the Woodland Trust. Jeremy Colwill, director of Payroll Giving, said: ''In partnership with the Woodland Trust, we introduced Carbon Capture, our award-winning service, in 2008. In so doing, we became the first organisation in Britain to lead the way in Carbon Capture Payroll Giving. ''The sheer number of applications we have received through it to date has proved its worth. ''As a result, we're now looking to phase out paper applications by July 30. We'll still accept paper requests, but plan to process the vast majority through our website. The principle of 'offset' schemes are to counteract the impact of emissions created from everyday activities - such as driving cars, heating homes and businesses, and flying. Celebrities, including the Rolling Stones, Hollywood actor Leonardo DiCaprio and Conservative leader David Cameron, have signed up to reduce their own carbon footprint. According to the Department for Environment, Food and Rural Affairs, Britons spent £60 million on offset schemes in 2006 alone. This is forecast to grow to £250 million annually by 2009/10. But the surge in applications has led, indirectly, to more deforestation. Offset providers usually send companies or individuals paper requests, which must be completed and sent back for processing. This leads to an unnecessary paper trail, and costs thousands of pounds in postage and administrative fees. But now Payroll Giving in Action, a fundraising organisation that works on behalf of the UK's 190,000 charities, has turned to the internet to cut costs and save resources. The Devon-based organisation, which has its HQ in Barnstaple, launched its Carbon Capture scheme in partnership with the Woodland Trust in February 2008, when 150 employees from Royal Mail signed-up to donate directly from their wage packet. Their donations helped plant 2,500 trees across the UK. It was the first time that employees at a British-based firm could offset their residual carbon emissions through tax-free payroll donations. Since then, Carbon Capture has become so successful that Payroll Giving now plans to abandon paper applications entirely. Environmentally-minded firms, and their employees, can log on to www.payrollgiving.com and complete their requests online. Using the site's online 'calculator, businesses and their employees can determine the amount of CO2 they need to 'lock up'. Once the request to do so has been processed, a donation will go to to the Woodland Trust directly from their earnings. According to Mr Colwill, a donation of just £25 will go towards the creation of 25 square metres of new woodland. He said: ''The Carbon Capture scheme is about contributing to the longevity of Britain's woodlands. A spokesman for The Woodland Trust added: ''We are delighted to be involved in the Carbon Capture initiative. ''It is a great way to engage staff and will help both an individual and companies themselves to make a dent on any impact that they have on the environment. ''Not only this but the Trust creates woodland at sites across the UK so contributors know they are helping to aid our cause of protecting and enhancing native trees and woods. For a suggested donation of £5, NSPCC can arrange for Santa to send one of his magical letters and make Christmas extra special for a child (or big kid!) you know. The letters are colourful, beautifully illustrated and uniquely personalised with the child’s name, gender, address and age. NSPCC have different letters for children of different age groups and every child in the same household will receive different letters. Last year NSPCC sent letters to almost 150,000 children all over the world, making their Christmas extra special! Sam Davidson from Henderson Group received the Highly Commended Best Large Employer Campaign award from the Rt Hon Stephen Timms MP –Financial Secretary to the Treasury. Henderson Group is a family run/owned food retail business employing over 2,300 people , in almost 400 stores across Northern Ireland. The judges felt this was a generous and wholehearted campaign. There was strong ongoing commitment, with a consistent improvement over a number of years, supported by excellent matching, administration and great publicity materials. Michael Burton and Michael McKeown received the Highly Commended Best Public Sector Employer Campaign award from the Rt Hon Stephen Timms MP –Financial Secretary to the Treasury. The Police Service of Northern Ireland employs 7,742 Officers and 2,557 Support Staff located throughout Northern Ireland. The judges felt they had achieved exceptional results with a well planned, implemented and measured campaign, impressively growing an already successful scheme. The very high take up rate of 28% was supported by good employer involvement and links with nominated charities. Whitbread Group innovation and creativity have been recognised at the National Payroll Giving Excellence Awards, held on Monday 5th October 2009. Jo Rackham from Whitbread received the Best Innovative Promotional Partnership from the Rt Hon Angela Smith MP – Minister for the Third Sector. Whitbread Group PLC is the UK’s largest hotel and restaurant group, managing the number one brands in hotels, restaurants and coffee shops, including Premier Inn, Brewers Fayre, Table Table, Beefeater, Taybarns and Costa. They employ 33,000 people who serve 9 million customers each month at their 1800 outlets across the UK. In partnership with Payroll Giving in Action, Whitbread Group PLC really pushed themselves to achieve more and to be innovative, cleverly using digital pen technology to engage staff, reduce paper and increase efficiency. The judges also thought the double matching initial donation was a great idea. Payroll Giving in Action introduced Whitbread to its new Electronic Digital Pen system. This allowed employees to sign up to payroll giving while the PGiA representative was on site, and together with web-based applications, reduced paper. It also allowed the internal departments to process employees donations without re-keying and provided Charities Trust with secure electronic data. The National Payroll Giving Excellence awards at HM Treasury on the 5th of October is one of the must-attend evenings of the Payroll Giving calendar. The deadline for entry into the National Payroll Giving Excellence Awards (NPGEA), a HM Government funded initiative, is now just around the corner. 10 July is the last date for employers to submit their application for recognition at this prestigious event, to be held at HM Treasury on Monday 5th October. There are, in total, eight awards, including two new award categories this year. These are 'Best Third Sector Employer' and 'Best Public Sector Employer', which makes it even easier for organisations of all types to get involved and get duly credited for their efforts and the amount they have raised. If you have achieved a Gold, Silver or Bronze Quality Mark Award this year, you are eligible to put your organisation forward for an award. As well as being a great publicity opportunity, the awards showcase philanthropic nature, a quality which has been proven to aid staff motivation and retention. We are delighted to announce that Payroll Giving in Action will be the major sponsor of the National Payroll Giving Excellence Awards 2009 The Awards will take place at the HM Treasury on Monday 5th October, attracting many of the leading companies’ active in Payroll Giving. The awards showcase the best examples of employers’ commitment to Payroll Giving and the benefits to UK charities. In a speech by HRH The Prince of Wales at the Second May Day Business Summit on Climate Change, London. Prince Charles told some of Britain's leading chief executives they needed to act before it was too late. "Royal Mail has pioneered an innovative payroll-giving scheme with The Woodland Trust that encourages employees to reduce emissions and then offset what is left. You would think, wouldn't you, that protecting the ultimate capital asset upon which all future income depends - in other words this fragile planet - was worth investing in, seriously and urgently?," he said. Payroll Giving is continuing to grow and raised almost £109 million for UK charities between April 2007 and March 2008, an increase of 22.5% from the previous year. In 2007/08 almost £109 million was received and distributed by the Payroll Giving Agencies to UK charities from employees donating from their pre-tax pay. More than 717,000 employees donated through Payroll Giving between April 2007 and March 2008 an increase of 11.5% from the previous year. April to March 2007/08 £109 Million In addition over £13 Million of employer-matched funding was received by UK charities. The Awards showcase the best examples of UK employers’ commitment to Payroll Giving schemes. The winners were presented with their awards by Rt Hon Stephen Timms MP, Financial Secretary to the Treasury and Campbell Robb, Director General, Office of the Third Sector, at a prestigious event hosted by the Institute of Fundraising at HM Treasury. A range of employers, sector and media representatives as well as Government officials attended the event, introduced and compeered by the Institute of Fundraising Chief Executive, Lindsay Boswell. Henderson Group win the Best Promotional Partnership Award. Henderson Group, the family owned franchises of SPAR, EUROSPAR, VIVO and VIVOXTRA in Northern Ireland, operate in over 65 stores with over 2000 staff. The judges thought the flexibility of Payroll Giving in Action was excellent and the assistance of the company was brilliant in this solid partnership. PGA visited staff at nights/weekends ensuring all were informed about the scheme to increase uptake, used partnership language and integrated their ambitious objectives with their wider Third Sector effort. Full matching, multi-language material and establishment of nominated links for the partner, all contributed to a very successful venture. Whitbread PLC is the largest hotel and restaurant group employing 33,000 people in 1,400 outlets across the UK. The judges commended this ambitious scheme, given the massive scale of the employer. It was an imaginative, innovative campaign with very generous matching. Payroll Giving has become part of their culture.